London has had a gastronomic explosion, and Champor-Champor Restaurant, London Bridge, is a restaurant to take notice of. Edward F. Nesta and I were back in London in November 2004, and had another incredible dinner at the Malaysian inspired restaurant, Champor-Champor! Owners, Charles Tyler and Chef Adu Amran, have had a busy year since we had last visited the restaurant in 2003. They completed their new wing of the restaurant, where in addition to adding a few more tables, they also have created a very private, raised intimate mezzanine dining area for two. After being escorted to the new wing and climbing a few steps, we found ourselves in our own little secluded room with shutters. We sat at a table lined with beautiful table runners, coiled metal candlestick holder with a white candle, a vase of heather, under a turquoise and navy ceiling with gold stripes, hand-woven fabric graced the windows, and my name was hand-written on a special card on the table, making us feel very much like royalty. The new dining room has rich, deep color on the walls, the chairs are slip covered with fabric, and the tables are draped in linens and topped with colorful runners. Although the restaurant has grown, it was nice to see that our favorite waiter, Zeq, was still there, and that their wine menu continues to impress with their interesting international collection of wines from China, Italy, Georgia, Argentina, Chile, New Zealand, India and the list goes on. Zeq suggested that we try the Indian wine from Grover Vineyards, 2002, Nandi Hills La Reserve Estate Bottled made in collaboration with Mr. Michel Rolland, Bordeaux, France, product of Bangalore, India, made of Cabernet Sauvignon and Shiraz, aged in French Oak barrels. Chef Adu surprised us with an amuse bouche of Aubergine bruschetta and Rojak salsa. The aubergine had a nice cilantro flavor and the salsa was served in porcelain spoons. Their hand-woven breadbasket had a tofu skim bread that we had been waiting for a year to taste again, and delectable fruit bread. 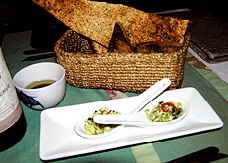 For our starters, we selected the Crab and fish begedil, with morning glory kerabu, yogurt and sweet chili dip, which was a crab and fish cake with a delicate golden exterior, and moist interior, that was accompanied by a sauce that commanded us to dip the white bread toast into it to gather up every bit of the sauce; and the Green mango, snake bean and roast coconut salad with wild mushroom vinaigrette, also very delicious was served in a hand-carved wooden bowl with a head on it. 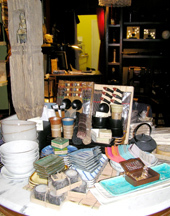 In addition to their creative menu, Chef Adu and Charles have bought eclectic pieces to showcase their cuisine. I love being transported to exotic locations through cuisine. Charles Tyler and Chef Adu have created an environment that makes you forget you are in London. Subtle incense imparts an exotic aroma, and the paintings, wall sculptures and other Asian artifacts including a wall of masks help paint the canvas so to speak, and Chef Adu completes the painting with his creative culinary offerings. Chef Adu, in addition to being a chef, is also an artist, as evidenced by his painting on the wall of the new dining room, which features a red cow with a paper mache head that extends out from the wall. The tables have a view of an outside garden with a Buddha statue, which was gently lit and contributed to the feel of having left London. For our palate cleansers, Chef Adu had some new taste treats for us, a Warm lemongrass barley soup, which was so refreshing and perfect for a cool November evening, as well as a Rambutan and Korean pepper granite, that kept us going from one palate cleanser to the other, in order to savor each of the different tastes. For our main courses we selected the Roast lamb cutlet biriani, with cumber and pineapple rojak, and edamame dalcha, and the King prawns in turmeric and tempoyak curry with cashew rice. The lamb was sweet hot, and the sauce was excellent. The prawns were served on a hand-carved wooden tray with a large bowl where the prawns floated in a delicious spicy “sea”, accompanied by a sweet green salad and a bowl of cashew rice. The Grover Vineyards, 2002, Nandi Hills La Reserve had a nice spiciness, which kept up with Chef Adu’s creations without overpowering or competing with the flavors of the food. Although they have a lovely selection of desserts, dessert wines, ports, Asian spirits and European liqueurs and digestifs, as well as an assortment of coffees, including a 5-spice coffee, many teas and chais, we decided that we were too satisfied to have anything else. Champor-Champor now also offers cooking classes on Saturday afternoons where students can learn some of the basics of Malay cuisine and culture. In addition, Chef Adu and Charles have now opened a store around the corner from the restaurant, Mari-Mari, www.mari-mari.co.uk, 41 Snowsfields, London, which features Chef Adu’s clothing designs, gorgeous pillows from Thailand, Indonesia and Malaysia, as well as interesting home ware, candles and other objects that you would be hard pressed to find anywhere else. Charles and Chef Adu continually amaze me as what they come up with, and on that note, I can’t wait to see what is next in store for them! 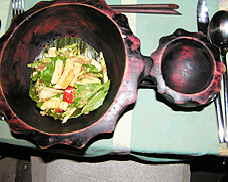 You may also read about our 2003 dinner at Champor-Champor in our Destinations section in the Best of London. Read other articles on London in Hotels & Resorts, Destinations, Music Scene, Chefs’ Recipes and Restaurants. © March 2005. Luxury Experience www.luxuryexperience.com All rights reserved.